Behold, he writes again!!! I almost cannot believe how long it’s been since my last post. For that, I’m truly sorry. A lot’s been up in this clown’s life – but I’m sure you guessed that already. A big hug to everyone who’s followed this spot, liked the page via FB, subscribed to site feeds – or checked this spot since my last entry. Today’s feature may explain why I’ve been away – but if it still doesn’t, please hold on to my apology. I’ve always wondered; what happens if the verdict of a “supreme” court is obviously flawed? Who sees to the peace of a peacekeeper? If the World Bank happened to be in crisis, whose role would it be to prepare a bail-out? I’m convinced that if half the crime that goes on in some American neighbourhoods happened in some other country, they’d storm in to restore order. But does being the “world-police” exclude the need to be policed? In case you’re wondering when I got political, I should state clearly that this has absolutely nothing to do with that; my hatred for that dirty game is eternal! It’s funny how life works; I’ve thought we (as humans) usually only need something to believe – true or not. It doesn’t make us cold or emotionless; it’s just the way of things. We are impulsive classifiers; we like to sort everything (heck, everyone) we come across as “requires attention”, “unimportant”, “lucrative”, “marryable”, “waste of time”, “good”, “bad”, “I like”, etc. This seems to be ‘our thing’; we just never tire. Again, this isn’t breaking news; I’m sure you find the idea familiar. What’s, however, funny is how rigid – and often misleading – our classifications can be. I’m sure you know the world’s deadliest predators are those who might even appear charming at a glance. It’s almost as if they’ve learnt to play on our tendency to classify the visually appealing as “good”. I once heard that Rowan Atkinson walked into a bank and just wouldn’t be taken seriously by the teller. He had an absolutely torrid time convincing her that he was there for a genuine transaction. But, why was that so hard? Why was it impossible for the teller to believe that Hollywood’s “Mr Bean” would need cash in real life? Money seems like a pretty basic need; so, what was the problem? Dear old Rowan Atkinson had been ‘classified’ – not as “human” but as a “clown”. We may have to go back to the very beginning to make some sense of all my rambling. I heard Diddy’s “Coming Home” – and a particular line caught my ear; he had made some reference to another song: “Tears of a Clown” by Smokey Robinson. The title’s metaphor was gripping, so I listened to the song. Immediately I did, my mom’s face popped up in my head! You see, growing up, she always had this thing for ‘absurd’ concepts. I remember her mentioning that an alarming number of clowns die miserable and lonely. Somehow, I don’t remember much else about that conversation – except that I learnt to spell ‘ridiculous’. I think I know a lot better now. So, a clown really makes people laugh? What else do we know about the species? Well, here’s one we often forget: they’re also human. That means they’re entitled to their fair share of worry, anxiety, fear, insecurity and emotion. Of course, we scarcely see any of that behind the painted faces. But, what really goes on in the corners of their hearts, in the quite of their homes – in those sober moments of introspection? We all have worries; we all nurse certain insecurities. We’re all not sure of what tomorrow will bring with it – and it sometimes gets to us. It’s particularly pronounced for people like me who’ve been “cursed” with a pretty compelling costume – a face that suggests we’re in charge. More often than not, we’re not – but people won’t stop believing we are. We’ve been classified (sadly) as “self-sufficient” and that often makes it extra difficult to walk up to someone and say “I have this problem – and I’ve just been dying for someone to talk to”. I’ve lost track of how often I’ve seen people react with total disbelief upon hearing me say “I’m taking malaria medication”. I mean, think about it, if a dressed clown walked up to you with tears in his eyes, wouldn’t you consider it an act? I dare to believe that if a totally miserable and frustrated clown walked up a stage sobbing, the audience would still laugh. As far as they know, if the “tears” represent value for money, he’s doing a good job. And, who’s to blame the clown for thinking life is mean? Would you fault him for calling the world cold, selfish and self-seeking? I certainly won’t; we all feel that way from time to time – and we wish somebody would walk right up, wipe our tears, listen to our plight and tell us everything would be fine. I really wish I could be that guy right now – but I’d be totally honest with you; sometimes, it just never happens. So, will you wait forever to get things back on track? Would you hang your life’s purpose on the possibility of hearing a few soothing words? You may hear them from me someday – but today’s not that day. What you’d hear from me today is a simple definition; I hope it suffices. I’ve heard people define life in all sorts of funny ways – but I choose to believe that life is a big fat cake! If you’ve ever seen one baked, you’d appreciate the bitter-sweet balance of things. It’s often only important that that cake is sweet – though most of the ingredients scarcely are. The eggs taste yucky, the flour tastes bland and the yeast is just foul – but overall, the cake is sweet. And, even in those moments when the baker burns the mix, he doesn’t just sit and cry. He gets right back in and makes himself another mix. Here’s the thing: life can sometimes be a mean, fastidious boss who cares little whether your bread is buttered. Sometimes, no one understands us; often, results don’t justify our efforts. Still, the job must be done. The world would take no excuse; the clown must perform. Even with tears in his eyes, they’d still laugh heartily. Our pains should never be reason enough to live without purpose. Life will always throw us challenges; the best of us all are those who have learnt to rise above them. I’m nowhere near where I dreamt I’d be a year ago; not even close to who I thought I’d be. I’m in a strange world – totally unprepared for the nature and extent of its pressures. But I’m here now – and the show must go on. Tomorrow may be as I’ve dreamt it – but I won’t throw today away. I have to wake everyday with a conviction to be the very best of me. 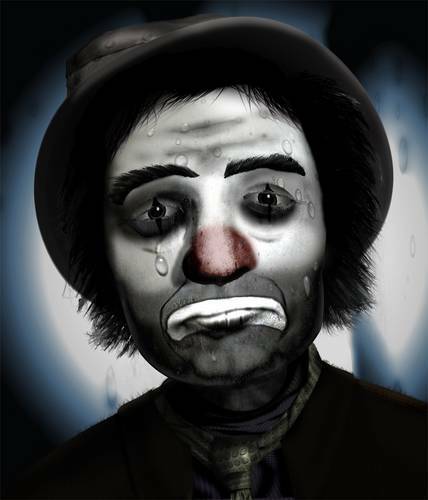 The tears of a clown are scarcely more than costume to the audience! So, till I get the chance to write again, my word to you: don’t wait up for the stranger with soothing words. Instead, give yourself a long hard stare in the mirror and tell yourself that, in spite of the flour’s blandness and the eggs’ yuckiness, your cake will be sweet. This entry was posted in Choices, Disappointments, Life, Resolve. Bookmark the permalink. bro…God go make u bigger… Nice job! Really must read this over again. Kudos and gudluck with ur training! This was an awesome read man. awesome. Many thanx, bro. Been a real while. U good? Thanx, Towx. Really glad it helped! Many thanx. Really appreciate it.